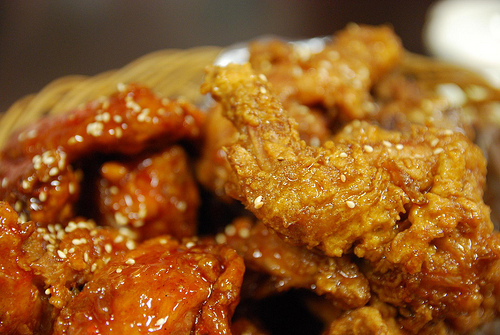 My experience with this place dates back to the super bowl (sorry), but I encourage you to get over to this place soon and get some Korean fried chicken. The crust is shatteringly crisp (the result of some rice flour and double frying(? )), and the pieces are bathed in your choice of sticky deliciousness: spicy, soy-garlic, or sweet. I’ve tried the latter two, and prefer the sweet. Note that this place has a miniscule, inconquerable parking lot and, perhaps more importantly, that it takes some time for your order to be prepared. Calling ahead is a fine idea. Best of all, the pieces don’t really suffer on the way home or overnight. Their menu has other choices, but I wouldn’t choose take-out (or dine in) wings from anywhere else in the area. Everybody’s been going here and writing about it, and I’d say it lived up to the hype. The comparisons to Chipotle are apt, if inevitable, but the food here is fresher and more vibrant. My wife liked the pork with beans arepa, while my favorite, surprisingly, was the steak with caramelized onions (not always a fan of the steak in these kinds of dishes). The fish/plantains special was my least favorite. Next time I’ll create my own arepa. 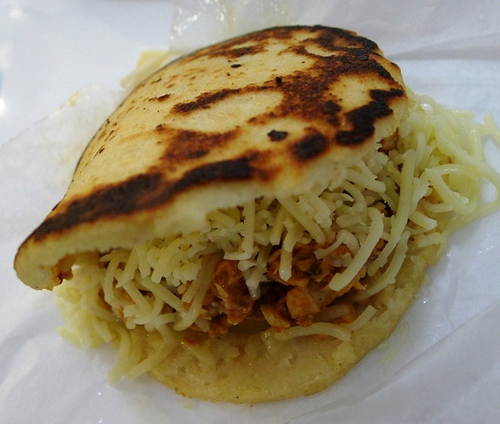 I loved the arepas themselves – think thick, moist corn tortillas. The sauce for each is served on the side, which is nice but a little confusing: do you pour it on? dip it?. The house “guasaca” sauce (somewhat like a chunky guacamole/pico de gallo hybrid) is delicious. The place is super clean and the staff is friendly. I’m eager to go back for more. I’d had their donuts before, as well as a day old biscuit, but I’d never been to the storefront. It’s extremely small inside, with very limited seating, but there are some tables out front. Be sure to grab a numbered ticket when you enter; the ordering queue gets a little jumbled as 1/2 the people don’t realize they are supposed to do this (I was guilty the first time through the line). There are biscuits with any number of toppings, and then there are the specialty ones featuring all sorts of gourmet arrangements. I went with a simple fried chicken biscuit ($3). The biscuit itself was super, the fried chicken – a little thin (too must crust/meat). But do try the ham biscuit – you get a nice fat hunk of roasted ham (not a traditional country ham like you might expect). The biscuits are big, but not quite big enough for an entire lunch for me. Thankfully, they have donuts too! Though I love sweets, I think the donuts here are second fiddle to the biscuits. Jelly-filled and chocolate glazed with sprinkles were average; the coconut cake, better. Many of the donuts are gourmet-creative-exotic, but I will say that some plain glazed mini ones we got recently were feathery light and just perfect. Like others in Durham, Monuts has graduated to a genuine store front, in their case beginning as a simple stand at the farmer’s market. The store is super cute, and they also serve home made bagels. And, somewhat perplexingly, wine and beer. But get a donut – you won’t regret it. I’ve tried a chocolate chai (cake) that was really good, an earl grey cake (great flavor, mediocre texture) and an apple cinnamon cake (crumbly and sugary in the best way). I need to get back and try some yeast donuts. I’ve also tried donuts from Sandra’s Bakery in Sanford and these were quite good, but I wouldn’t go way out of the way for them. 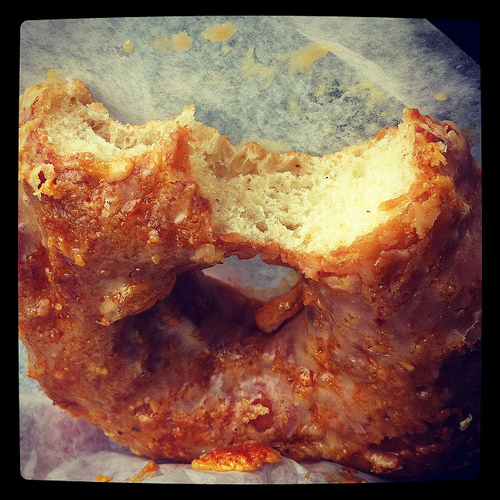 I’ve had an excellent buttermilk donut from the Cup 22 coffee shop in Saxapahaw, though donuts at the general store next door have been less than thrilling. I’ve yet to try Daylight Donuts, but people seem to really like them (they are a nation wide chain). And, speaking of chains, last but not least, there’s good ol’ Krispy Kreme, whose “hot now” glazed donuts are pretty hard to beat. Recently I wrote about Durham’s Mateo and how it made that city feel ever more cosmopolitan. While Mateo brings Spanish flair to the Bull City, just down the block Pizzeria Toro bolsters the European vibe with Italian charm and elegance. It’s not an upscale restaurant, per se, but Toro offers a beautifully simple style, and, more importantly, excellent food. I’d say it rivals Bella Mia as the best pizza in the Triangle, in a much more attractive setting (for me). It fits perfectly in Durham, whose restaurant scene continues to evolve with more and more high quality, big-city caliber joints. Toro occupies a small space that is dominated by a circular wood-fired oven towards the rear of the restaurant. Actually, the restaurant is shaped like an “L”, with entrances on two adjoining streets: one door to the narrow bar, another (main) door to the dining room. The space achieves an effortless chic with minimalist decor, but they have clearly put plenty of thought into details like the lighting (spotlights on the wood logs that fuel the oven), flatware, and “hand-towel” napkins. There’s a communal table in the middle, and high tables along the sides, along with a few window counter seats. Although the high tables and stools are not really ideal for small kids, the restaurant appears to be adaptable: witness the very small child I saw recently suspended in a basket-like contraption clamped to the side of the table – I’d never seen anything like it. This place gets crowded, so come early. The menu is limited in the best way. A few apps, a few salads, a selection of fine hams (similar to Mateo) and more than enough pizzas to choose from. The problem is choosing one. Divided into “red” and “white” categories, they all sound fabulous, many with exotic toppings like spicy lamb meatballs, brussel sprouts, or clams. Note that the menu changes frequently to feature local seasonal ingredients. My wife assured me that one pie was enough for both of us, so we chose the onion/taleggio/pistachio (white) pie ($13). It arrived looking great, with a slightly charred, lightly oiled crust sprinkled with sea salt, hunks of melty tallegio, and plenty of onions. Indeed, this pie was loaded with raw red and white onions, which was fine by me. The crust was mildly sweet, and not really as ethereal as that at Bella Mia, but almost as good in its own way. The toppings were more substantial than I’ve had at Bella Mia. Overall, the pie tasted great, with perfect seasoning, but I’d be eager to try out a different one next time. Really minor quibbles would be uneven distribution of toppings and fairly un-crunchy pistachios. My wife, as usual, was right – the one pie was plenty to fill us both up. As Durham’s restaurant scene continues to expand in exciting ways, Mateo and Pizzeria Toro are helping to fill some of the Triangle’s bigger culinary voids (excellent tapas and gourmet pizza, respectively). Judging by the meals I’ve had at each and their initial popularity, here’s hoping these restaurants are mainstays for years to come. And though I probably won’t mistake myself for being in Barcelona or Florence, I’m thankful that the comparison is even possible. Cary’s Taqueria Del Sol is a bit of an odd bird. It’s part of a “chain” with just a handful of locations – in GA, TN, NC, and PA. Despite its Mexican name, the restaurant does not serve strictly Mexican food. The menu runs the gamut from tacos (duh – but with unusual fillings) to chef’s specials like shrimp and grits. And the atmosphere, it must be said, is kind of strange. The food we tried was hit or miss, but the hits were sufficient enough to bring me back for another try one day. The restaurant opened a few months ago in a cavernous lofty space in Cary Crossroads. We were there the other night, and it was virtually empty. Of people, yes, but also of decor. Granted, two of the walls are mostly windows, but the rest of the space was a bit white-washed and rather sterile, mixed with a few oddities here and there. Witness the 2 or 3 rustic “Corona” tables nestled among the many plain tables and chairs, or a red dresser with a bowl of tangerines sitting incongruously near the front door. Other than that, the ambiance is strikingly spare. The pendant lighting is hung up near the ceiling (which is probably 20 ft high); bringing the lighting down several feet would probably make a nice impact, although I’m not sure the pendant style really fits. Anyway, the overall effect is, despite the spotlessness and abundance of natural light, decidedly un-cozy. There is a small bar, and they do have a lot of plastic tables with umbrellas outside. It seems best suited for a quick lunch or dinner. But enough about that. As I mentioned, the menu has some quirks. These are not your classic Mexican tacos. Their individual price ($2.39) is a bit high considering you can usually score some authentic Mexican ones for under $2, sometimes even as low as $1.50. There’s a small card of kid’s menu items, for which the prices are inexplicably missing. You order at the counter and they’ll bring your food to you. I opted for two tacos, the “Memphis BBQ” and the “fried chicken”. My wife went with two others, the “carnitas” (one of the few straightforwardly Mexican items on the menu) and “veggie”. We ordered a cheese enchilada ($3.39) for our daughter. You can choose your sauce for the enchilada, and I asked for the least spicy one. This happened to be “lemon cream”, which I probably should have guessed would be a poor choice. We also ordered chips and guacamole ($3.79). The food came out alarmingly quickly, within a few minutes for sure. First was the chips and guac. These were actually outstanding. The chips were fresh made and still quite warm, and nicely salted, and the guacamole was fresh, chunky, and just right. Our main orders followed shortly. Our taco orders came in little plastic baskets, while the enchilada came served on a real plate. The tacos (served in flour tortillas) were a fine size, so two with some chips would probably be enough for most diners. The chips and guac were enough for all three of us to share, so, if you’re by yourself, this place may get little pricey for a quick meal. Anyway, the bbq taco was good. It tasted just like you might expect, with a nice tangy, spicy sauce and a bit of coleslaw. My chicken taco was not so great – a couple of lackluster chicken tenders, some mayo, and not much iceberg lettuce or tomato. It really had an unappealing fast-food flavor. My wife reported both of her tacos to be good. The veggie one was spicy. As for the cheese enchilada, this looked and tasted fairly bad. It was smothered in a really thick sauce, and the cheese inside was not really even melted. Everything was the exact same color – the cheese, the flour tortilla, and the sauce. It amounted to a cheesy salt bomb with some lemon flavor; even my daughter, who normally would be fine with something of that description, didn’t care too much for it. With a few tweaks to the dining experience and perhaps to the pricing, Taqueria Del Sol could probably be a consistent winner. I’ll most likely go elsewhere for my regular taco fix, but, for something different, I might give it another shot. It seems there are plenty of tapas places these days, but a lot of them take the small plates concept and apply it to whatever cuisine they want. While that’s fine, it’s nice to have a new place in Durham that aims to come a little closer to what you might find in Spain (not that I’ve been). And while Mateo is not strictly Spanish food, it offers some unique options – and it’s damn good. Apart from the basic glass store-front facade, which doesn’t really match the decor, stepping in to Mateo makes you feel like you’re in a big city. It’s very dim, with elegant pendant lighting. Huge tarnished mirrors line one wall above a maroon leather banquet. A nice wooden bar runs along the opposite wall. It’s all about dark rich materials, industrial metal stools, and exposed wood. You might say the look is becoming a little cliche, with hefty rustic wooden clipboards that hold the wine lists and exposed decaying brickwork in the bathroom, but, overall, it feels nice and luxurious. An elegant staircase toward the back of the space and a semi-open kitchen gives you the impression of being in a grand old house, in the same way as at chef Matt Kelly’s other restaurant, Vin Rouge. Mateo, though (chef Kelly’s first solo venture), subtracts some of Vin Rouge’s formality in favor of a more laid back atmosphere, complete with rock music on the radio. Unfortunately, although they spent several minutes “preparing our table”, some crumbs on the seats and a stained, sticky, and fraying menu detracted a little bit from the upscale experience. Still, this is a great date spot. Keep in mind that it’s a cavernous space, and I’d bet it gets pretty loud when completely filled out. • Croqueta (nightly special) – chicken and mahon cheese with sweet potato aioli ($4). Three mini golf balls of fried goodness. The sweet potato aioli was an unappealing pukey-brown color, and wasn’t really necessary, but these were tasty. They had a bit of smoky chipotle flavor. • Huevo Diablo – “Spanish” deviled egg wrapped in chorizo ($4). You get two halves (1 egg), each egg half resting improbably in a little sausage “boat”. I liked them fine but my wife loved them, saying they somehow evoked the flavor of a loaded baked potato. • Bocadillo – bbq pork, piquillo pepper, cheese, pickled cabbage ($4). Two mini-sliders on nice buns sprinkled with coarse salt. 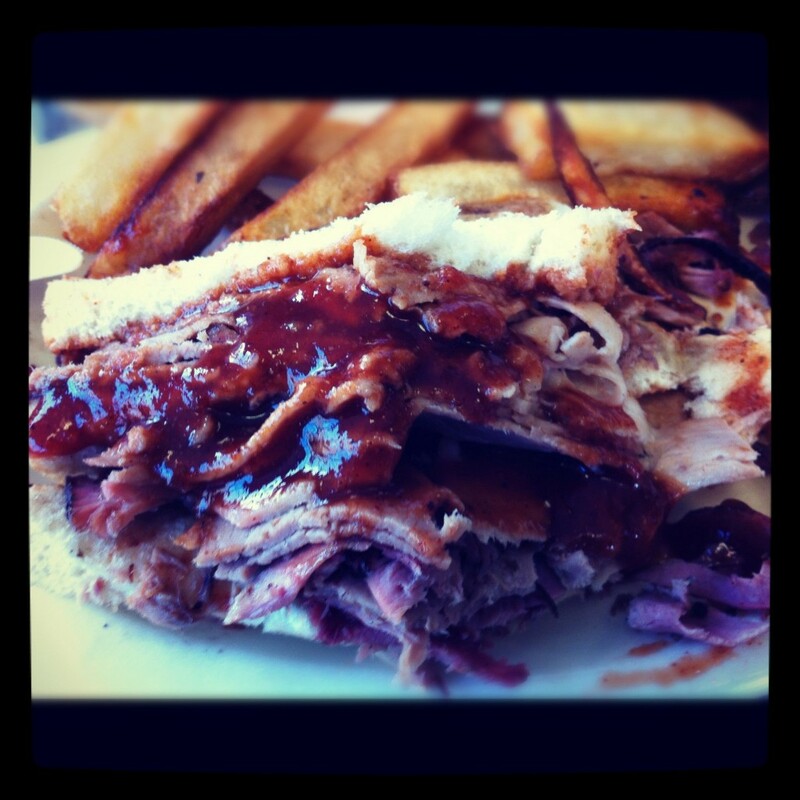 Think gourmet/exotic Carolina bbq sandwich. The pork was not super tender, and I didn’t really notice the cheese, but the overall effect was quite good. • Pan con tomate – Bread with tomatoes ($3, small order). So simple but oh so good. Two slabs of warm crusty bread loaded with garlic, olive oil, and crushed tomatoes. They’ll bring you regular bread upon request, but you won’t want it after eating this. • Ensalada de Manzana e Manchego – bibb or butter lettuce, honeycrisp apple, almonds, shaved manchego, orange, sherry-membrillo vinaigrette ($7.50). This was probably the least exciting thing we ate. It just was not memorable, being mostly lettuce with sparse accoutrements. • Chicharrones – chicken fried chicken skin, piquillo chow chow ($6). Super crispy crusty bits of fried crunchiness. Not great by themselves, but very very good with the chow chow and creamy dressing on the plate. • Costillas Cortas – braised short rib, sofrito, Carolina rice grits, rioja ($14 I believe). Extremely tender meat in a delicate smoky tomato-y broth, with creamy grits. This was one of my favorite dishes of the evening. • Churros – Three long cinnamon fried-dough “donuts” ($6). These were really light and airy, and came out piping hot. They are served with a little cup of some thick hot chocolate for dipping. Excelente! All of the food was good, but I was most impressed by the balance and marriage of flavors. The components on each plate were nicely proportioned and, with just a couple exceptions, all contributed something valuable to the dish. I thought it showed a great attention to detail, even if I would have welcomed a bit more spiciness in certain plates (especially the deviled egg and bbq pork). 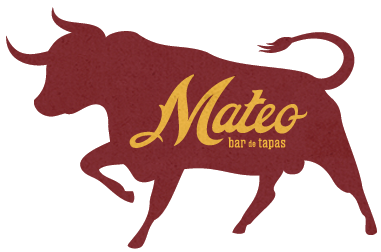 So, regardless of authenticity, I’d venture to say Mateo has got to be one of the best tapas places in the Triangle. I’m looking forward to my next visit! Years ago, I was lucky enough to spend a little time in France. One of the most fond memories I have, as you might guess, is of the excellent food. If one restaurant in the Triangle comes closest to recreating that overall experience, it has got to be Durham’s Vin Rouge. An institution in the Triangle, this place has served up consistently good food for many years. But the appeal of Vin Rouge is not just about the food. The restaurant is quintessentially French, really capturing the je ne sais quo – charm, let’s say – of a classic European eatery. The inside is set-up rather like a home, with a sort of rambling layout of large but discreet dining rooms. Lovely wooden tables (covered in white tablecloths), huge mirrors, and low lighting combine with a semi-open kitchen to establish a sense of unfussy elegance. With beautiful wood floors, chandeliers, and candles on the tables in the evening, the space is warmly seductive, but it manages to achieve an easy conviviality that keeps it from being overly fancy. Also boasting one of the most attractive patios in the Triangle, Vin Rouge is a fantastic spot for a romantic date or special occasion. 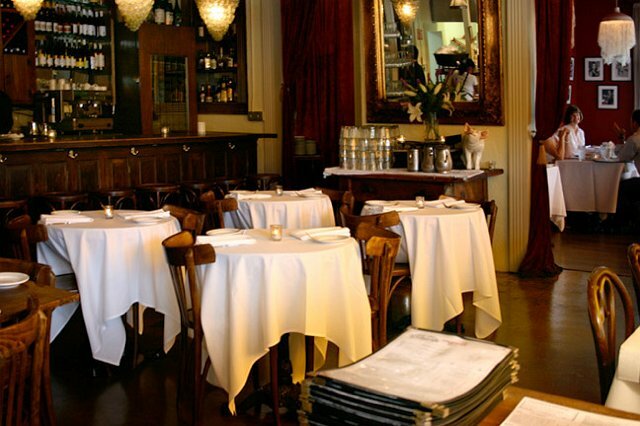 The food is strictly French, with a narrow, focused menu of bistro classics. Although there are nightly specials, the menu doesn’t change much. I’ve yet to try any of the fruits de mer (seafood) at Vin Rouge, but they do claim that as a specialty of the house. Either way, you’re started off with some crusty bread served in a small metal pail. The bread is really thinly cut, and can be too crusty. At brunch time it’s accompanied by butter, while for the dinner service you get a small dish of excellent olive oil/olive paste for dipping. I’ve been for brunch a number of times over the past few years, and the meals have been solid but not spectacular. I recently ordered an omelette with mushrooms and gruyere ($9.95). It was a huge omelette, and it came with an even larger mountain of skinny french fries, but overall it was a bit unexciting. My wife has always been happy with their eggs Benedictine or eggs Florentine. But dinner has been better. I’ve tried their decadent macaroni and cheese, and it may come closest in the Triangle to rivaling Ashley Christensen’s wonderful rendition at Poole’s. Most recently, I ordered steak frites (hanger steak, $19.95) and a salad with lardons, blue cheese, apples, and pecans ($7.95). The salad was tremendous – best split with another person, and very good, with just the right amount of delicate vinaigrette. The steak was a bit chewy, though it was cooked to a very nice medium. It was kind of over-run by the accompanying blue cheese butter and dressing from the tiny green salad on the plate. Once again, the french fries were way too numerous but perfectly adequate. My wife made the better entree selection – a pork chop with braised cabbage, mashed potatoes, and cider jus ($18.95). The pork could have been a little more tender, and the sauce was close to too sweet, but really this was just plain delicious. For dessert, we opted for the chocolate mousse, which is delivered to your table in a large serving dish, out of which the waiter scoops three little dollops into each of your bowls. The mousse was surprisingly thick, I thought, but supremely rich and not terribly sweet. At Vin Rouge you can really feel like you’re in the middle of France, and you’ll get a very good meal in a gorgeous setting. Still, when comparing Vin Rouge to Rue Cler (downtown Durham’s other upscale French restaurant), I’d have to confess a slight preference for the latter. Rue Cler’s ambiance is not as warm as that at Vin Rouge – it’s more modern – but it’s very inviting nonetheless. And while Vin Rouge does bistro classics very well, the food at Rue Cler is a bit more adventurous and can be stellar (see my review here), and, for brunch, at Rue Cler you have the option of some heavenly beignets. Either way, you may not feel the need to travel all the way to France. So let me know what you think and bon appetit! Central BBQ – Based on the research I had done, my first choice was Payne’s, but they were closed on the Monday I was in town, so this was my fall back option. I ordered it to-go, but this place had the look and feel of a chain restaurant, which I wasn’t expecting. I ordered a pulled pork plate with beans and cole slaw, plus a large slice of coconut cake (made by a local bakery). The pork was really good, tender and smoky, and I thought the sauce was excellent. It had a unique quality that I couldn’t quite put my finger on. The beans were rather mushy and kind of bland The coleslaw was really coarsely (almost randomly) chopped, but tasted nice and creamy. The meal came with a throwaway dinner roll. I saved room for the cake, which was very good. Oklahoma Joe’s – This place is in a gas station, but operates like a more established restaurant, with plenty of tables and friendly staff coming to check on you and bring you some wet wipes when you’re done. I ordered a combo plate with pulled pork and ribs, plus creamy coleslaw (they also have the option of “spicy” coleslaw) and french fries. Here the pulled pork had good flavor and was exquisitely tender, but it had an unappealing sliminess. The ribs too were nothing to get excited about in my opinion. The sauce tasted very generic to me, like your standard jazzed up sweetened ketchup. The meal came with a huge paper bag of fries and one or two pieces of texas toast buried under the ribs. It was way too much food, and I didn’t come close to finishing it. LC’s – This place restored my faith in Kansas City as a bbq mecca. Actually, it did more than that – this was probably the best ‘cue I’ve ever had. At LC’s they do it more of an Arthur Bryant’s style, with smoked sliced meats piled high between some regular old white bread. (I’d been to Bryant’s twice many years ago, and I recall it too being outstanding) The restaurant itself is a bit run-down, and it’s small inside, but it is worth the drive out to the SE corner of the city. Inside, there’s a large vault-like smoker chamber, all blackened and charred, behind the order counter, from which your meat emerges to be sliced to order. I opted for the pork (again!!). The sandwich, if you can really call it that – it’s virtually impossible to lift up and eat with your hands – was awesome. The meat comes out minimally sauced, and you can add more at the table (it’s good), but you hardly need to. The fries weren’t the greatest, so I briefly entertained the idea of ditching the fries and getting another sandwich, but that would have been a bit gluttonous, right? If I’m ever back near Kansas City, this is where I’m going. Oakleaf in Pittsboro has got to be one of the most beautiful restaurants in the Triangle area. Located in historic Chatham Mill, this place has it all: aged wood floors, enormous windows, simple but elegant wooden tables and chairs, fabulous pendant lighting, classicly understated white dinnerware, stunning metalwork including a massive old sliding door… I could go on and on, but the point is this: the entire aesthetic, down to the simply printed menu, has been executed in exquisite detail. It makes for a lovely dining room, with tables not too close together, a gorgeous large centerpiece table, and a fine balance of formal and casual. But does the food match the decor? It certainly aims to. We visited for brunch on a recent Saturday, and entree selection was exceedingly difficult – everything sounded just right. The menu is what I’d call American-locavore-modern. I went with the potatoes bravas/fried egg/chorizo gravy ($9) plus a biscuit ($2). My wife opted for the “aged gruyere/sage/fried egg/extra cheese sauce” sandwich, which came with a side of fries ($9). Another in our party ordered the challah french toast ($8, I believe). We were pleasantly surprised when a small bowl of freshly fried beignets arrived at our table shortly thereafter. These were soft and delicate, and just a touch underdone and undersweetened – but that’s pretty nitpicky – they were quite good. The rest of our food took a very long time to arrive, even though we were one of the first customers of the day. My plate was sort of an unattractive mess of potatoes covered in a spicy reddish brown gravy. It was ok, but I wouldn’t order it again. The biscuit was large and included a very small amount of herbs – not really even enough to taste; it was pretty average. My wife’s sandwich, on the other hand, was very good. I’ll also note that it was huge, featuring two very thick slices of bread. “Dressed” in cheese sauce, it was most certainly a fork-and-knife affair. Anything with that much cheese would probably be good, but the fresh sage brought a real vibrancy to it. The fries were outstanding. The challah french toast was actually a little plain, despite a (too) small amount of excellent peach-ginger compote accompaniment. This dish was also enormous, with four very thick half slices of bread. Like the sandwich, it probably could have been enough for two people. The bacon on the side was fine. So, though it wasn’t an exciting meal, it really was an exciting place to eat a meal. The prices are terrific for brunch, considering the portion sizes. Service was terribly slow in our case, but that wouldn’t stop me from coming back. Heck, I’d come back again and again just to sit in that awesome space. I know barbecue joints can be divey – you almost expect that – but it can add to the personality of the place in a positive way. Not so with Backyard BBQ Pit, a small roadside restaurant in bustling Research Triangle Park. This place, it must be said, is just kind of dumpy. Below the food counter, where servers load up your plate from cafeteria style metal trays, the yellowed wall is scrawled all over with marker. This feature bears an unfortunate resemblance to a gas station bathroom stall. Combined with the dated decor, it gives an overall impression of neglect that is not very inviting. In fact, I nearly turned around and walked out upon entering. But I pressed ahead, in hopes that some good food would distract me from the ambiance. The menu is straightforward in a classic bbq joint sort of way. I ordered a chopped pork bbq plate ($6.49), which comes with two sides. None of the sides looked particularly appealing, so I opted for mac&cheese (for my daughter’s sake) and green beans (to get some veggies in). I think the mac&cheese has a different price than other side items (as the restaurant’s website claims), or else the coleslaw I also asked for raised the total price a little, but regardless it was definitely an inexpensive way to feed the two of us. The food was just so-so. The barbecue was good enough, but pretty unexciting. It was pretty coarsely chopped, which I like, but it wasn’t terribly smoky, though they reportedly cook over wood. There are a variety of sauces you can add if you choose. I was not a fan of the bland, super-finely chopped coleslaw. The hushpuppies (it came with three) were large and sweet but had likely been under a heat lamp for a while. The macaroni and cheese was cheesy and and a little greasy. I let my daughter eat most of that; she certainly had no problem with it. The green beans actually would have been quite good if they hadn’t been heavily oversalted. So yeah, I crossed it off my list of local bbq places to try, but I really doubt that I’d go back. If I did I might try the ribs – a lot of people seemed to be ordering those. One thing is for sure: I would insist on getting take-out.